First things first, if you're looking for the giveaway (or the design book tutorial) you can find it here. I'll be picking the winner sometime tomorrow, so there's still time to enter! As an added bonus, when I post the winner tomorrow I will also be posting my infamous apricot scone recipe...okay, it may only be infamous to about six of us on Twitter, but I figured I'd share anyway! Granny Square update: All 150 granny squares are done! Yay! Right now, I'm just weaving in the ends and then they'll be all set to join. Hehe ya, this is me in my generally impatient state - I should have woven the ends in at the end of each square, but I wanted to get them all made so much and now I have to go through this tedious exercise 150 times in a row (and each block has 6 ends that need to be woven)! Yesterday morning, before heading off to my Toronto Modern Quilt Guild meeting, I decided to hit up the St. Lawrence Antiques Market which happens here in Toronto every Sunday. It was great! I've been many times before, but I just love browsing through all the vintage knickknacks, books, clothing, and just plain awesome stuff. I didn't get much yesterday, but I did pick up a couple of spools of vintage ribbon and lace. And actually, when I was buying these, the man selling them informed me that the whole box of ribbon and lace he was selling had been collected by a group of people with disabilities and that whatever money he got for selling the stuff would be given back to them. I thought that was really nice! I have made (and am still making) a few things recently, but unfortunately I can't really show any of them right now. A couple of pieces are on their way to friends, so after they receive them I'll be sure to show pictures (wouldn't want to spoil the surprise, now would we?). So, in my last post I mentioned some news about Jennifer and I going to a certain place in May that rhymes with pinneapolis. Only one person (Bonnie) took a stab at guessing where it was we're going - she guessed Indianapolis for Indy 500, which frankly is a pretty good guess considering the information that I gave, but it wasn't the right one! We're heading to (Spring) International Quilt Market in Minneapolis! For those of you who may not know, International Quilt Market is a giant (and I mean giant) trade show that is held twice a year - the Fall one is always in Houston and the Spring one moves around. Fabric companies and designers all converge to show off their new collections and designs for the upcoming season, oftentimes these items won't be released to the public for another six months. Fabric shops (online, and brick and mortar shops) attend Market to decide what fabrics, patterns, notions, etc they want to purchase for their shops in person; often designers attend Market to show their fabric and pattern designs to reps in the hopes of either being picked up by a company or as a means of getting their name out there. Market is going to be awesome all by it self, and I'll finally get to meet in real life a lot of people that I originally met online such as Jennifer, Cara, Monica, and Lissa. There are also a few other people who've said they'd like to meet like Kate Spain. I also have serious plans to do a little stalking...by stalking I mean continuously walking past their booths taking covert photos...maybe I'll work up the nerve to approach a couple of them...Amy Butler, Heather Bailey, Camille Roskelley, Anna Maria Horner anyone? Teehee! But, one of the big reasons that I am heading to Market is to show my quilt pattern designs to some reps and other people! It's just so cool! Above you can see a sneak peak of one of my most recent patterns made using fabrics from Kate Spain's Verna Line. This is part of the reason why I haven't been able to show much of what I've been working on lately - gotta keep the patterns under wraps until after Market ( and hopefully a little longer too)! We'll see what happens. Jennifer is the only person who has seen some of the new designs and we had a pretty funny moment talking over BlackBerry messenger last night when I mentioned to her that I was looking for a 1/4" foot for my sewing machine. Jennifer asked me what had happened to my old one, and I said that I had never had one, her response was "what?? how do you piece?". I explained that I just did it by eye. This may not seem funny to anyone who hasn't quilted and had to worry about seams lining up exactly, but I found it pretty entertaining. Okay, I'm off to do some schoolwork now and the I have to leave for class in an hour and half.. Less than two weeks and I'll be done this semester (thank goodness). 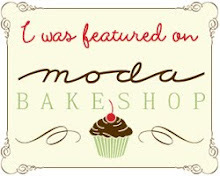 I'll be back tomorrow with the giveaway winner and the "infamous apricot scone recipe". How exciting that those cool fabric designers will be there! Excitement much! And wow, you are sooooo dedicated. Look at all those Granny Squares! Awesome job, chica, they look sooo cute! Oh my goodness, I can't believe you don't have a 1/4" foot! I only made one quilt without one, and luckily my mom had an extra one she was willing to give me. It has made my life so much easier - you will love it!!! You are so lucky to be able to go to quilt market! I am sure you will have plenty to tell about it when you come back. Good luck with your quilt patterns! I hope you have fun at quilt market! I'm from Minneapolis and miss it dearly... you'll have such a good time!! The infamous apricot scones sound delicious! I hope your trip to Market is a success. It was great to see you again at the TMQG meeting. I love going to Quilt Market. It is a ball and it is tough to get to sleep at night. You don't have to worry about stalking anyone....just walk right up and say hi....these are the nicest people you will ever meet, honestly. I have not run into one cold person there. Have fun and wear comfy shoes :) Maybe I'll see you there....I'm a very tall red head...lol. 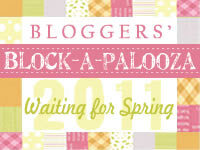 ps....I'm hosting 30 days of giveaways...stop over to my blog and put your name in. Love the sneak peek of your quilt top! I love the fabrics! BTW-u and the girls are going to have a blast at market! That is one giant stack of granny squares! I love it! Can't wait to see them all together! I had a little moment and decided to come back and browse your blog. I just love this sneak peek. 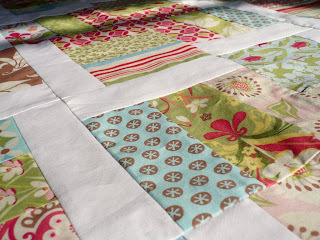 Verna is so pretty and spring-like - I can't wait to see how this whole quilt turns out when you reveal it to the blogging quilters out there. It looks gorgeous.